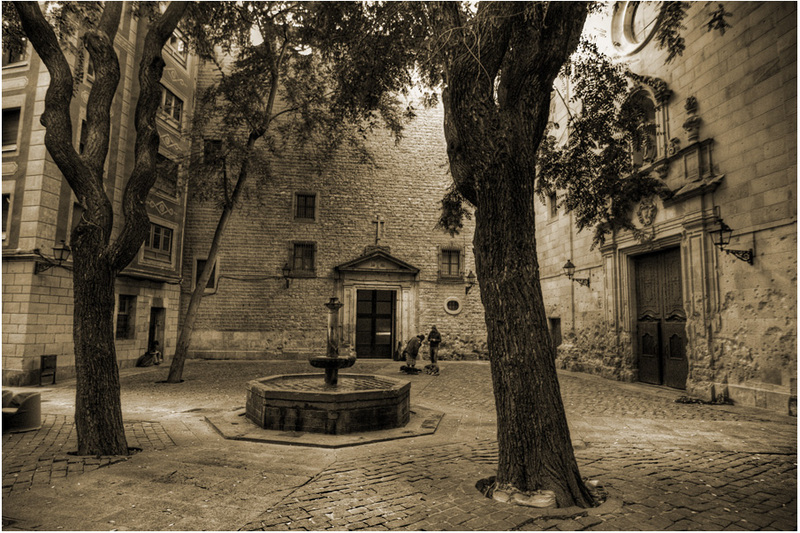 Guest Post - La Lista - I know, I know, Barcelona isn't technically in London either, but after the success of La Liste in Paris (worth reading first for some continuity), more guest cities had to eventually make an appearance. Day 1: Thursday - Very early morning flights meant midday was a much more acceptable hour to start drinking, so after dropping off our stuff at the hotel, we headed straight to Park Güell. 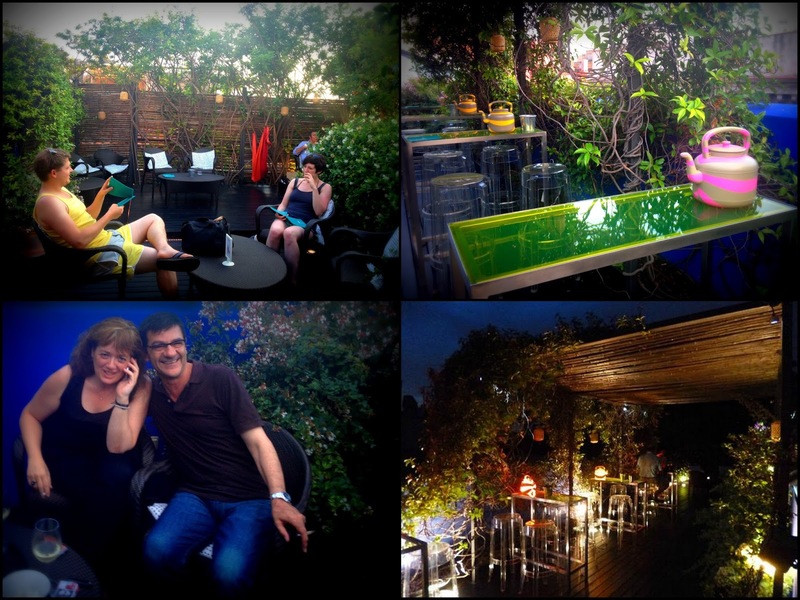 Whilst it's not a bar, it's certainly a great place to visit with bottles of cava, €1 beers and a picnic in hand. Make sure to go right to the top of the park for a panoramic view of the city. Team List (Tim "Soon to Return to London" Henshaw, newcomer and fountain of local knowledge Georgi "McCrafty" McCarthy, and birthday girl Shannanagrams) then headed to La Rambla for a bit of tourist action, only to be distracted by Irish bar Ryan's and their promise of Sangria on tap. Ryan did not disappoint. After eating vegetarian tapas for dinner (if you're still hungry you can always order the curry with rice for dessert, like Tim), Georgi's sister Jaime arrived (also new to Team List) along with local boy Marc - an old friend of Georgi's from Barcelona. Keen to be shown around, we were directed to a bar called Tequila Boom Boom with the strongest €3 cocktails ever tasted. The club we ended up in is probably (definitely) not worth mentioning. Day 2: Friday - A lazy start to the day was inevitable, but the early afternoon provided an excellent discovery. In the hidden and eerily beautiful Plaça Sant Felip Neri, a subdued spot in a sometimes manic city, the rather upmarket Neri hotel restaurant looks like the only place to grab a beer. But on asking if the tables were reserved for eating, Team List (Tim, Georgi and Jaime) was directed towards a sequestered lift which took us up to a fourth floor rooftop bar. Carlos the waiter provided menus and pointed us in the direction of a delicious bottle of fizz, whilst Antonio and his wife Montserrat (who only spoke into her phone, even when we pulled the camera out) helped us to suss out what the rather kitsch teapots were for (it was unclear, but we settled on lighting). Next, a visit to the excellent Basque bar Sagardi was on the cards. 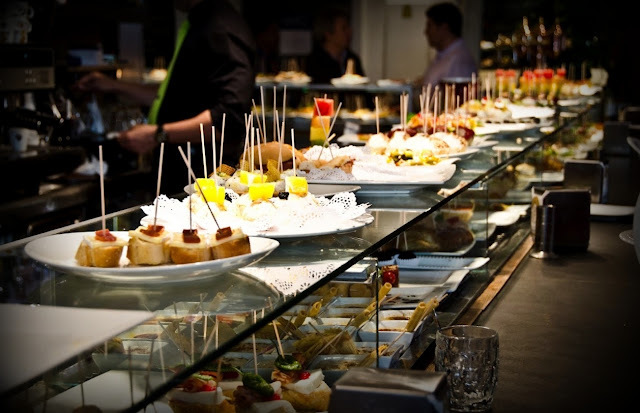 With huge platters of “pintxos” (tapas on sticks) on the counter, and an honesty-driven "count the cocktail sticks at the end" policy of charging, it would be very easy to keep eating without noticing (until the beer runs out). Definitely worth seeking out. Our next stop was dinner on-the-go at Wok to Walk. The Subway of the stir-fry world, you choose your base, your bits and bobs and your sauce, and watch the very cheerful (crazy) chefs fry it up in front of you. A "muchas gracias" here, a "muchos de nada" there, and we were on our way. Next up was the rather intriguing Bosc de Les Fades. 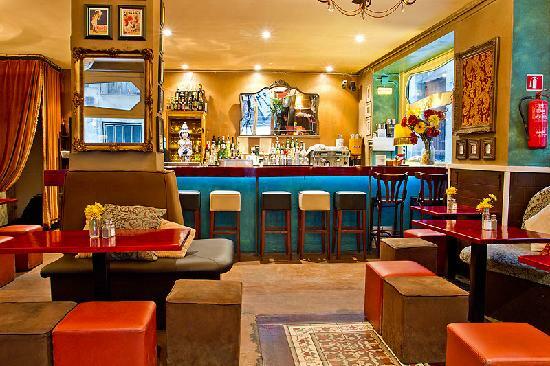 Just off La Rambla, it is a café with average croissants, a wax museum, or a bar with indoor trees and more strong cocktails, depending on whose review you read online. We found it to be the third one, and ordered our poisons. 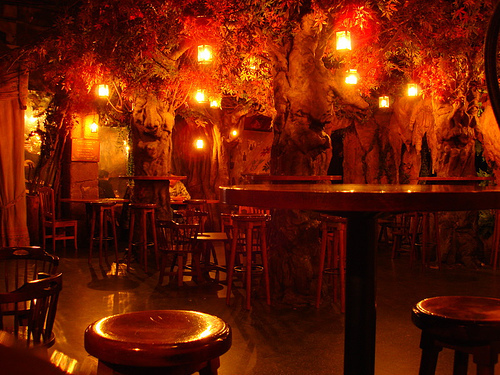 The cocktails were pretty standard, but it's the scenery that makes this bar. 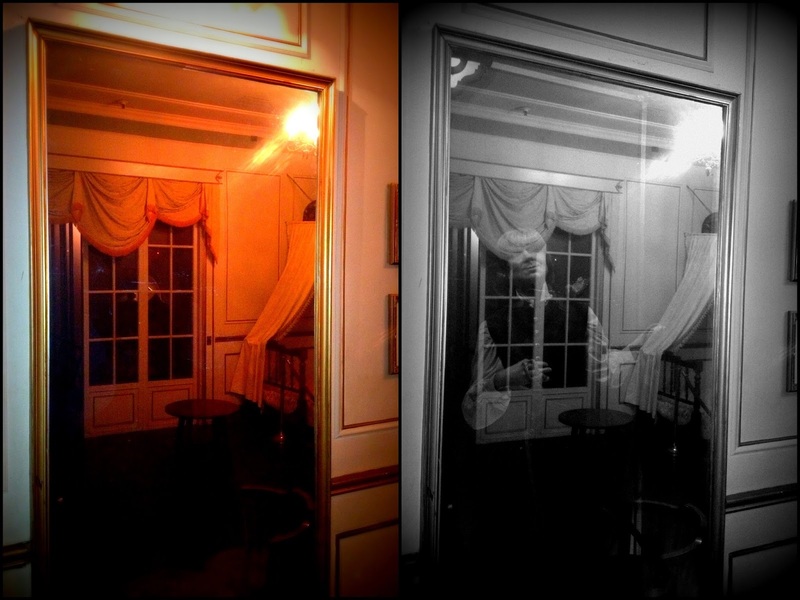 The trees, the haunted room, and a creepy mirror/window kept us amused until we'd finished our drinks. Milk Bar was next on the list, and the cocktails were probably the best we had in Barcelona (rivalled by the strawberry daiquiris in Andú bar on Saturday). Milk is a simple bar, doing all the little things right: comfy seats, chic décor, delicious (strong) cocktails, friendly bar staff and angel wings hanging from the ceiling. Yeah, we didn't know we liked that either. As we left, Georgi spotted a bar just around the corner which was one of her old favourites. 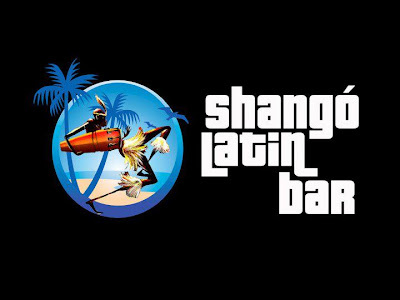 With a name reminiscent of our absent friend, Shangó had loud salsa music playing, a mezzanine that was too small to stand up on, and a homage to the Virgin Mary behind the bar. As you do. The mojitos here went down very easily. Day 3: Saturday - Georgi and Jaime were delighted to find a bar belonging to one of them (which one was never decided), and we saw another with an amusing sign, but being late for lunch as we were, we didn't have time to go in. Early evening saw Team List grow as we took on OShan's Eleven, Jess, Josie, Marc (of Day 1 fame), Juan and Sandra, and we finally made it to Andú bar, where English Gary manned a small bar with an out-of-tune piano ("Be my guest, if you can work out which key plays which note," said Gary). 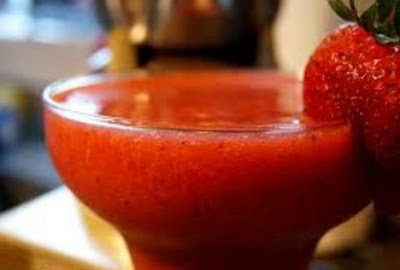 The strawberry daiquiris were made with fresh fruit and came in what must have been a pint glass. The blackberry versions were smaller and less tasty for the same price. We went around the corner as Barchick had pointed us towards the pirate-themed "Hook Bar", but this had been turned into a hemp appreciation club. We were politely asked to find somewhere else. The nearest place was Bar 32, where a List-appropriate dinner was planned. Juan and Marc knew of "the best tapas restaurant in Barcelona", so we sidled over to Bidasoa. Whilst perhaps not the restaurant serving the best tapas, it could well be the best restaurant serving tapas. 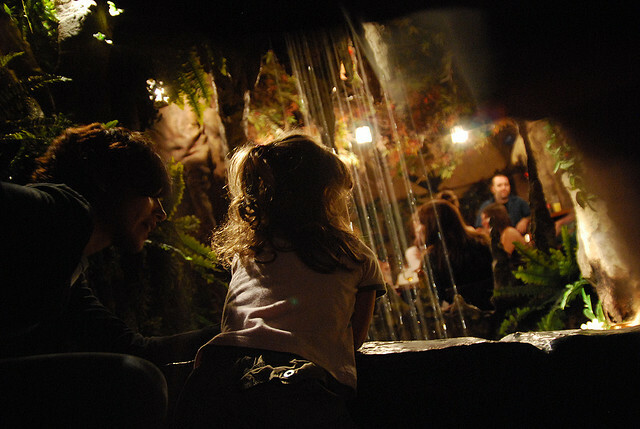 Owner Raúl stood behind the counter, a mere metre away, as he and his staff prepared the food. For every plate we finished, he would add a new one, whilst shouting incomprehensible words (possibly because I don't speak Spanish) to his team. The three-day list extravaganza ended, rather symmetrically, in another Ryan's bar, which we were tempted into by a man promising 15 shots of vodka or tequila for €15. Again, Ryan did not disappoint. Team List Points go to Tim (10), Georgi (10), Jaime (9), and Shannon (3) - what was she doing all day on Friday?